Changes in your work life can be stressful for anyone. You may be a new job seeker or career changer. You may be facing a lay off. This information can help you with work changes so you will not be as stressed. Job security is not certain in this New World of Work. You may lose your job through no fault of your own, or with little or no warning. It's a good thing that you do not have to face these changes alone. You may have things in your life that you are not sure how to handle. Support services can help you with child care, health care, transportation, and other needs. Go to the library or you can use the Internet. Or find a career coach who can help you. • Find local, state, or federal social services near you. • Connect with family and community services. • Join employment programs that fit your unique needs. In ReNEW look for the Jobseeker Success Mindset Training program. Get a new way to look at job search and an understanding of what employers want most. Also see Job Search and Job Boards & Resources in ReNEW. 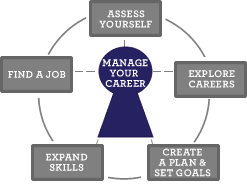 If you are ready for career planning, go to Assess Yourself. You’ll learn how to find jobs that match your skills, interests, and goals. Be clear about how to Manage Your Career. Know how to Move Forward in your career.